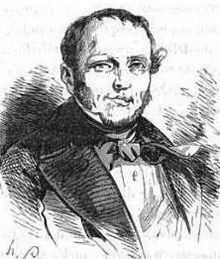 According to Michel Crouzet,* literary scholar of Stendhal, it was on this date in 1831 that the protagonist of said French author’s magnum opus was guillotined. “Everything passed simply, decorously, and without affectation on his part,” is the entirety of Stendhal’s death scene for his man. Julien Sorel, the flawed (or anti-) hero of The Red and the Black (Le Rouge et le Noir), is the intelligent son of a provincial carpenter who puts his wits to use trying to climb Restoration France’s treacherous social ladder. Ambition, says Stendhal, is “the very essence of his existence,” much as it is for his milieu, and through Julien’s exertions — brilliant and resourceful at times; infuriatingly handicapped by social prejudice against the protagonist’s low birth at others — the author sets down one of the most psychologically forceful works in the canon. Is it a mere jealous fit? Even though his victim survives the attack, and forgives her lover, Julien obstinately pleads guilty, and insists on his own maximum culpability. It’s not only an individual criminal culpability, but a culpability of class aspiration. ‘I ask you for no mercy,’ Julien went on, his voice growing stronger. ‘I am under no illusion; death is in store for me; it will be a just punishment. I have been guilty of attempting the life of the woman most worthy of all respect, of all devotion. Madame de Renal had been like a mother to me. My crime is atrocious, and it was premeditated. I have, therefore, deserved death, Gentlemen of the Jury. But, even were I less guilty, I see before me men who, without pausing to consider what pity may be due to my youth, will seek to punish in me and to discourage forever that class of young men who, born in an inferior station and in a sense burdened with poverty, have the good fortune to secure a sound education, and the audacity to mingle with what the pride of rich people calls society. * The date is not explicit in the text. The Red and the Black was subtitled Chronique de 1830, but several past-tense allusions to the event show that the main action takes place after the July Revolution of 1830 that toppled Charles X and raised Louis-Philippe to the throne. There is, however, a late and seemingly anachronistic allusion to Julien’s lover/victim intending to “throw herself at the feet of Charles X” to appeal for his life. Oh well: ambiguity is the novel’s stock in trade. ** These (fictional) de la Moles are very proud of being descended from the (actual) Joseph Boniface de la Mole, whose signal achievement was his April 30, 1574 beheading. On this date in 1836, three men were guillotined for a spectacular but unsuccessful regicide attempt. when the liberal banker Laffitte led his compère, the Duke of Orléans, in triumph to the Hôtel de Ville, he let fall the words: “From now on the bankers will rule”. Laffitte had betrayed the secret of the revolution. It was not the French bourgeoisie that ruled under Louis Philippe, but one faction of it … the so-called financial aristocracy. It sat on the throne, it dictated laws in the Chambers, it distributed public offices, from cabinet portfolios to tobacco bureau posts. Hard to imagine such a state of affairs. Fieschi (English Wikipedia page | French) et al conceived a bold attempt to destroy the entire ruling family in a single fusillade, and to that end constructed a machine infernale of 25 gun barrels mounted together to fire on a single fuse. Unleashed upon a royal procession along the Boulevard du Temple on the fifth anniversary of the monarchy’s founding July days, this monster proved quite impressively destructive. The assassination attempt of Fieschi, 28 July 1835 by Eugene Lami. Police soon traced the conspiracy to Fieschi, a truly Gallic character of mixed-up national pride, personal honor, class envy, and opportunistic lechery, who had fought for Bonaparte and helped Joachim Murat on the latter’s fatal attempt to re-take “his” kingdom of Naples back in his youth. But lately, a more worn-out and middle-aged Fieschi had been booted out by his mistress and lost all his money. Fieschi, according to Barricades: The War of the Streets in Revolutionary Paris, 1830-1848, basically became a dependent of Morey and Pepin, true-blue republicans who helped channel Fieschi’s unmoored passions into engineering his hydra-headed musket. He’d be back on the French-nationalism side by the end. More repressive laws and radical-hunting followed. They did not slake the thirst abroad in France for regicide. * Louis-Philippe’s royal dad backed the French Revolution, but was still executed by Robespierre. Louis-Philippe, the affable, ovate monarch of France’s bourgeoisie from 1830 until the revolutionary year of 1848, was a popular guy for radicals to take a shot at. By one expansive reckoning, there were no fewer than 19 assassination attempts against the Pear King, and five executions of intended regicides. This date in 1841 saw the beheading of one Ennemond Marius Darmès for attempting to gun down the French king the previous October. Though it didn’t harm the king, the alarming incident did help precipitate the fall of a precarious and self-dealing government led by Adolphe Thiers, whose most illustrious appearance in these executioners’ annals was yet thirty years away. With Thiers out of the way and a foe more doctrinaire animating the government, the ensuing months’ investigation were dedicated to tracing a connection between Darmes and alleged co-conspirators among revolutionary Parisians … a lot increasingly disaffected by the July Monarchy’s extreme oligarchical outlook. And in a performance familiar in our own day, the terroristic extremity provided convenient pretext upon which to shush the much wider portion of the populace dissatisfied with the state. You’re either with us or you’re against us! Out of solidarity or pride of ownership, Darmes denied those connections all the way to the shadow of the blade: two men who went on trial for their lives with him were acquitted. At half-past 5 o’clock this morning he was called down from his cell to the greffe, where the fatal toilette was to be performed previous to the execution. He quietly submitted to the operation, and when it was over, he mounted with his confessor into a vehicle, commonly called ponier a salade, which is used for the conveyance of prisoners. 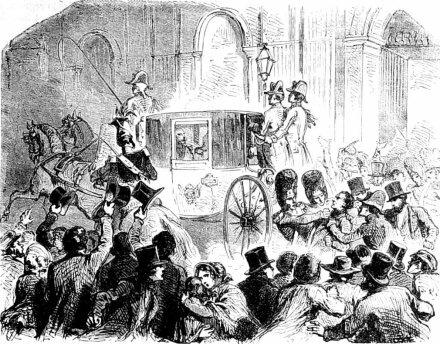 This carriage, escorted by municipal guards, cuirassiers, and chasseurs, proceeded up the Rue de l’Ouest, Rue d’Enfer and the adjoining Boulevard, down to the Barriere St. Jacques, where the scaffold had been erected during the night. Few spectators were in attendance. At 5 o’clock all the avenues leading to the Barriere had been occupied by the military, all traffic interrupted, and the people, who had congregated near the scaffold, were driven back a considerable distance. After he had alighted from the carriage his sentence was again read to him. The clergyman then took leave of him, and he ascended the steps of the ladder with a steady pace, followed by the executioner’s aids. It was only when he reached the platform that he came within view of the people; his head was still covered with a black veil, and a white shirt enveloped his whole body down to the feet, which were bare. The executioner having placed him with his back to the guillotine, a dialogue appeared to pass between them; and, from the negative shake of the head which Darmes occasionally gave, it was supposed that the executioner had held out to him a hope of salvation if he would make revelations. The conversation occupied between three and four minutes; the aids then seized him, and having placed him with his face towards the knife removed the black veil from his eyes, and took off his shirt. The sight of the instrument of execution appeared to strike him with awe; he started, and, feeling rather unsteady of his legs, he made a stride in order to maintain his equilibrium, and then looked on with calmness, surrendered himself into the hands of the executioner, and an instant before the knife dropped he was heard to exclaim — Vive la France. The body and head were then placed in a basket, and conveyed to the cemetery of Mont-Parnasse, where they were interred in the enclosure exclusively reserved for regicides. Our favorite part of that is that the cemetery had a special VIP section set aside for regicides. Only in France. Francophones can enjoy this French-language report on the investigation. On this date in 1793, Philippe Egalite was hoisted on his own petard. Still, the phrase sounds like something that ought to come right out of the French Revolution, redolent (as are petards themselves: the explosive word is from the French “to fart”) of angry mobs hoisting aristocrats, as was their wont, up on pikestaffs and lampposts and … petards. Whatever those are. 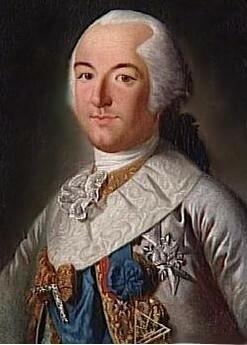 Philippe Egalite — the Duke of Orleans, as he was known for most of his life — was such an aristocrat: in fact he was royalty, the First Prince of the Blood and a cousin to Louis XVI. Now that is a petard. Philippe’s class-traitor politics obviously exposed him to the wrath of the monarchists — a particular irony since the man’s son Louis-Philippe, was France’s last king from 1830 to 1848 — but as usual in Paris during the Terror, it was the the Revolution devouring its children that did him in. Despite taking up during the Revolution the very Republican name Egalite by which we know him, and despite Egalite‘s vote in the Convention in favor of guillotining Louis XVI (this is sometimes described with more melodrama than accuracy as the “decisive” vote), and despite his many years’ prior revolutionary sympathy, the Duke of Orleans was rounded up with the rest of the available Bourbons when the French General Dumouriez‘s spring 1793 defection prompted a panicky revolutionary purge in Paris. Philippe’s own son, the future king, had gone over with Dumouriez to the Austrians. The Duc d’Orleans employed Choderlos de Laclos, author of the notoriously delicious Dangerous Liaisons. As an individual citizen turned politician turned guillotinee, Egalite doesn’t much stand out in those perilous years: one more vulnerable Convention delegate outmaneuvered by Robespierre et al. As the Daddy Warbucks of the Rights of Man, however, Egalite was a titanic figure for his contemporaries. Not many held him in high personal esteem, but movements need moneybags, and the Prince of the Blood bankrolled his from the bottomless revenues he earned on estates that would dwarf entire departements. invented something novel in the history of French politics: the massive use of wealth, research, and propaganda** for the purpose of forming public opinion and swaying public policy. No doubt there are analogues among the Romans and the eighteenth-century English; but here we are almost reminded of the Rockefellers and Kennedys. Orleans was accused of generating all this mayhem to make his own bid for the throne; those accusations may even hold a bit of truth. Such machinations remain for the conspiratorial among posterity a shadow-play upon the wall; one is left to guess at their potential dimensions from shreds of evidence and the vying vituperations of various contemporary revolutionary factions. But if extant, such schemes were fatally compromised by the mediocrity of the figurehead who lost his head this day. Though a revolutionary in his philosophy, he was still a doughy Bourbon scion in his soul, and heir to the many shortcomings that characterized that dynasty in its decadence. Dissolute in the enjoyment of privilege; irresolute in the conquest of power; blithely rearing wolves to his own destruction. That was some petard. Philippe Egalite and his onetime lover Grace Elliott are the titular characters of the 2001 Eric Rohmer movie The Lady and the Duke. * Hilary Mantel is the same author who penned the acclaimed historical novel Wolf Hall, about Thomas Cromwell. ** Kelly claims that Egalite funded Marat. Early this Monday morning in 1836, Louis Alibaud — having been condemned to death by the Chamber of Peers at trial the preceding Friday and Saturday — lost his head for taking a shot at oft–shot–at French King Louis-Philippe. 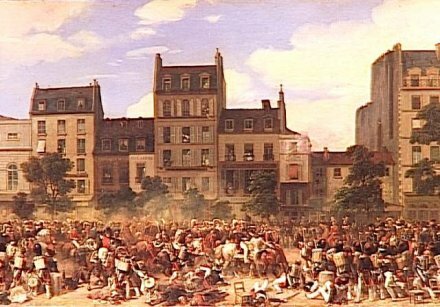 at half-past 6 in the afternoon of the 25th of June, 1836; the windows of the carriage were lowered, and it was passing through the gate [of the Tuileries palace] leading to the Pont Royale, when a man, who had been standing by a post in the court, raise [sic] a cane gun and discharged it against the King. By a miraculous chance the King was lowering his head to salute the National Guard under arms, and the ball passed just four lines above his head, and entered one of the angles of the carriage, settling about an inch deep in an oak beam. The assassin was immediately arrested; he was a young man, of about 25 years of age, dressed in a dark coat, cloth pantaloons, and black hat, and wearing under his chin a thick brown beard. Naturally, this line had neither the intent nor the effect of securing clemency, and he was repeatedly cautioned by the court against pursuing it; all concerned knew precisely where matters were headed, of course, and the state had no interest in providing a public forum for sedition.